NASCAR driver, Ryan Newman, was born on December 8, 1977 in South Bend, Indiana. Ryan Newman is currently a driver in the NASCAR Sprint Cup Series. He drives the #39 U.S. Army Chevrolet Impala for Stewart Haas Racing. Newman graduated from Purdue University in 2001 with a B.S. in vehicle structure engineering. In 2002, he was the Raybestos Rookie of the Year. Newman began working for legendary racing icon Roger Penske in 2000, winning 3 of the five ARCA RE/MAX Series races he entered, and making his Winston Cup debut at Phoenix International Raceway. 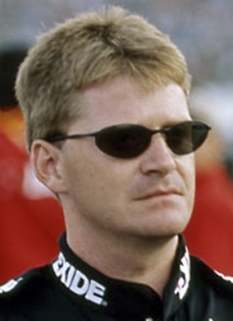 In 2001, Newman continued in both ARCA and NASCAR, while attending Purdue. Around this time he would meet racing legend Buddy Baker, who would eventually become his mentor on superspeedways. On July 14, 2008, it was announced that Newman would part ways with Penske after eight seasons. Newman has been confirmed as a teammate to 2-time Cup Champ Tony Stewart at the newly formed Stewart-Haas Racing team in 2009. In 2002, Ryan Newman won a season-high six poles, breaking the record set by Davey Allison, and won his first career Busch Series race. In September, he won his first career Winston Cup race at New Hampshire Motor Speedway after starting from the pole. Newman also became the second rookie since Dale Earnhardt Jr. to win the The Winston. He beat out Jimmie Johnson for the Rookie of the Year award. Ryan Newman enjoys fishing and working on vintage automobiles, particularly 1950s Chryslers. Newman's car was featured on the cover of the 2005 EA Sports computer game NASCAR SimRacing, and he was actively involved in its development. DISCLAIMER: PFP Sports Talent Agency does not claim to represent itself as the exclusive agent for Ryan Newman. PFP Sports Talent Agency is a booking agency that represents organizations seeking to hire pro athletes and sports personalities such as Ryan Newman for speaking engagements, personal appearances, product endorsements and corporate entertainment. Fees on this website are estimates and are intended only as a guideline. Exact fees are determined by a number of factors, including the location of event, the talent’s schedule, requested duties and supply and demand. PFP Sports Talent Agency makes no guarantees to the accuracy of information found on this website and does not warrant that any information or representations contained on this website will be accurate or free from errors. We are often asked how can I find out who is Ryan Newman's agent? To find Ryan Newman appearance fees and booking agent details, you can contact the agent, representative or manager through PFP Sports Talent Agency for speaking fee costs and availability. PFP Sports Talent Agency can help your company choose the ideal sports personality for your next marketing campaign. To hire Ryan Newman for an appearance, speaking event or endorsement, contact Ryan Newman's booking agent for more information.